Though flying squirrels are true members of the squirrel family, Sciuridae, they do not really fly, but glide. 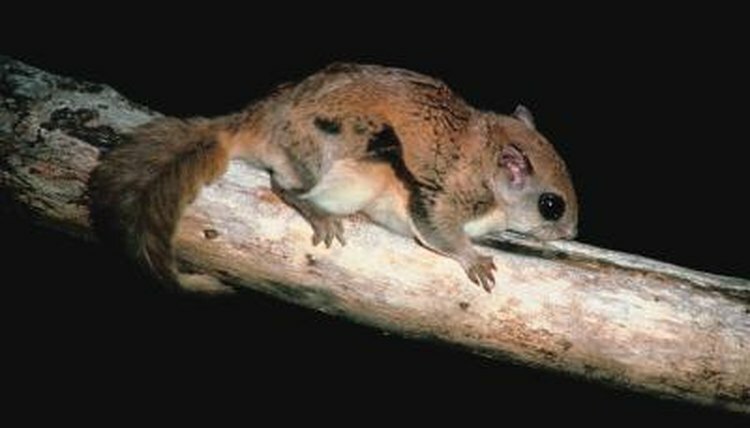 The the two species of flying squirrels in North America, the northern flying squirrel (Glaucomys sabrinus) and the smaller southern flying squirrel (Glaucomys volans) contain 29 subspecies between them. G. volans and G. sabrinus are the most common subspecies across the entire range in which the two species occur, so measurements for houses are based upon their preferences. However, researching before building will ensure a properly sized box for flying squirrels in your locality. Measure and cut a single piece 8.5 inches wide by 10 inches long from a 1-by-10 board 61.5 inches long, using a table saw with a cutting guide to make straight cuts. Mark that piece “roof” and set it aside. Measure and cut a 2.25 inch strip off one side of the remaining 51.5 inch-long, 1-by-10, using the table saw, to leave a board measuring 7 inches in width along its entire length. Measure and cut the following lengths from the 7-inch wide board: three pieces 10 inches long (mark those “front; side 1 and side 2”); one piece 16 inches long (mark it “back”); and one piece 5.5 inches long (“mark it “floor”). Cut a hole 1.5 inches in diameter, using a 1.5 inch hole-saw attachment for the drill, near the upper right corner on the outside surface of side 2. Place the hole ½ inch from top and back edge of the board. Optionally, drill a second, 1.5 inch hole in the bottom left corner of side 1 as an escape exit in areas prone to tree-dwelling snakes. Holes should be diagonally opposite one another when the box is assembled. Drill four ½ inch diameter holes, using a ½ inch drill bit, in the floor near the corners and two more holes ½ inch from the bottom of each side piece, for ventilation and drainage. Drill two ¼ inch diameter holes – using a ¼ inch drill bit – through the back piece ½ inch from the top and two more ½ inch from the bottom to use as mounting holes. Assemble front and sides of the box using six 1.5 inch long brass wood screws placed near the corners and center of the the front piece, into each of the two side pieces. Mark 3 inches from both top and bottom of the back piece and set the assembled front and sides – front facing out – between those lines. Screw on the back with six more screws spaced similarly to earlier construction. Fit the floor into the opening at the bottom of the box and fasten it in place with two screws through each side and the back. Do not fasten the front edge of the floor or the screws will interfere with removal of the front piece for later cleaning. Fasten the roof across the top of the box – holding it in place with two screws fastened down into the side pieces through the top. Use two more screws into the top from the back. Again, for easier cleaning, do not fasten the front piece to the roof. Finish by adding a bead of waterproof, non-toxic silicone caulk along the seam between the back and roof to prevent water infiltration. Install boxes – using 4-inch galvanized nails or brass screws into the tree – 10 to 26 feet high, preferably in coniferous trees for G. sabrinus or in mixed deciduous forest for either species. Face the entry hole away from prevailing winds.  If building for G. volans, reduce all dimensions by 1 inch and reduce the access hole to 1.25 inches in diameter.  Use only unpainted, unstained, untreated softwood with a rough surface – like cedar – for better gripping surfaces.  Clean the box annually by unfastening the bottom four screws along the front edges of the box and tilting the front panel up using the top two screws as hinges. Replace the screws after cleaning. ⚠ Wear leather gloves when inspecting boxes and clean only in January or February – when boxes won't be in use.